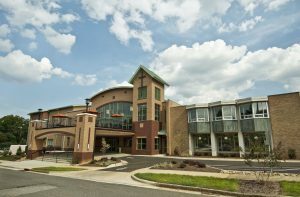 Two years after its opening, the Faith Center continues to exceed expectations, serving the congregation and the community. On average, the building hosts 64 to 83 events each month, according to Ruth Ann Diehl, business manager. In 2015, contemporary worship had an average attendance of 124. In 2017, that number has grown to 190 for the 9:27 service. Krista Woolly has hosted several community events there in her role as executive director of the Community Care Clinic. The Faith Center played host to the clinic’s 20th anniversary celebration, and was the site for filming a video shown at the event. A community health summit — with plenty of room for breakout sessions — also took place in this building. In fact, VBS was the first event that took place in the new building in August 2015, even before it was dedicated in mid-September. Courtney Bost, director of the Child Development Center, says that children and staff alike were thrilled to attend VBS once the new space was available.